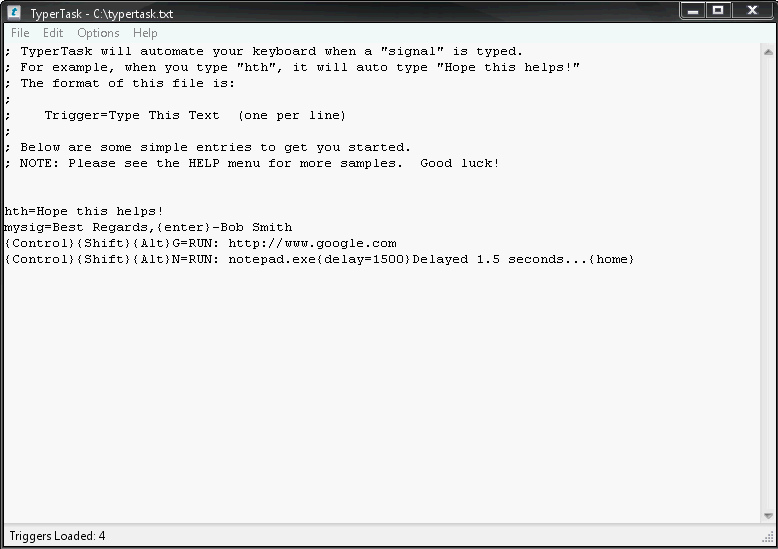 TyperTask is a powerful automation utility with a simple text-based interface. The program enables a variety of capabilities including automatic text replacement as you type, launch of web addresses and files via hotkeys, mouse events, window focus and more. Note that first-time users should read the detailed instructions and examples of function definitions available under the Help menu. NOTE: Program discontinued, linking to archive.org. Also available from PortableApps (thanks shnbwmn). How to extract: Download typertask.exe to a folder of your choice and launch. Thanks to smaragdus. I have made V1.20 available for direct download. The download link does not work. I can provide the executable if needed. The page is gone but the program can still be downloaded from the developer's site. TyperTask is the best text substitution/replacement app on Windows. @veyselcelik: i can't replicate the issue you're having. If i write "hth" it writes "Hope this helps!" (with the "i"). Maybe it's your keyboard layout causing trouble? @lautrepay, I just downloaded and type hth. and it write Hope ths helps! (with no). it's own example rule, so i didn't write any rules. I guess it is about my windows' language. @veyselcelik: I've been using TyperTask for about a year and have never had problems with missing letters. Perhaps a problem with the rules? I'm explaining my issue above. For example, When I write "hth", program must write "Hope this helps!". But it writes "Hope ths helps!" (no lower i) No trouble with upper İ and other letters. only lower i. I can't make it write lower i. I'm using Windows 7 x64 Turkish. it doesn't write letter "i". How can this be? I use both AutoHotkey and Autoit and they are great apps. TyperTask's advantage is its small size. I'm just pointing out some limitations. It would be unrealistic to expect the power and versatility of AHK or AI in a 52k package. It is very similar in how it works and AutoHotkey is far more powerful than TyperTask. Appears to be a limit to the number of characters that can comprise a Custom List. It freezes/hangs up whenever a custom list exceeds 214 or so total characters. Also, custom lists are automatically numbered, but don't display a number after the 9th item. Haven't used it enough to see if there are other limitations. Still a useful program though. A powerful and useful program for such a tiny download. The simple appearing interface is really misleading. Easy to use and great for automating tasks quickly. Also, the Custom Lists feature is handy for easy launching of apps and documents. i havent tried this yet, but the author also makes TinyTask and that's really good, it records mouse and keyboard and plays it back for automation of events. Gives me some confidence that this program is maybe ok too. I've finally had a chance to play with this program and I love it. It's going to make sending those cover letters a breeze. TyperTask is slightly larger by 30kb, but seems to be good. Need to give this a testdrive! "False positive will be fixed in next VPS update." For me the matter is resolved- False Positive. I was misled because 20 out of 43 Antivirus application detected TyperTask as malware. Yet TyperTask cannot be downloaded from the Publisher's site. TyperTask home page is no longer available at the Publisher's site and there is no e-mail available to contact the authors of this application. This sequence of coinsidences seems very suspicious. So I replaced TyperTask with Autotext (http://www.autotext-software.com/, which has the same functionality. I was using this application - TyperTask 1.13 for quite some time, but all of a sudden Avast! reported it as malware. I performed a check at VirusTotal (http://www.virustotal.com/file-scan/report.html?id=de52f4702dd0548b69524cf90ed109b94459efcf9eb23ef326f78fa522c534f5-1286504590) and almost half the Antivirus Programs detect it as malware too. I wodner whether this is a false positive or not, the program looks like a harmless autotext notepad-like tool. I will be grateful if anyone can disclose the truth about TyperTask. Great Software and very useful! Only thing that I miss is an Option to start it in Tray-Mode.